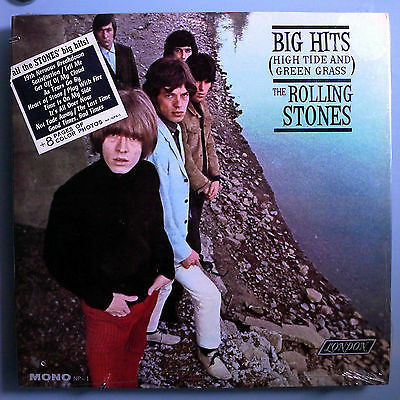 · ROLLING STONES - BIG HITS (HIGH TIDE AND GREEN GRASS) - ORIGINAL 1966 LONDON RECORDS MONO LP NP-1. · THICK CARDBOARD GATEFOLD COVER, AMERICAN STYLE. Track listing: Satisfaction - The last time - As tears go by - Time is on my side - It's all over now - Tell me - 19th Nervous Breakdown - Heart of Stone - Get off of my cloud - Not fade away - Good times, bad times - Play with fire; Finding a still sealed original MONO copy of this Rock milestone?!?! Forget it – not even a HOPE!!! This may be the last one you will ever see. (b) The album is guaranteed to come with the original 8-page insert/booklet intact. (d) The record is apparently pressed on a beautiful, thick, inflexible vinyl, which was usually used for the first or very early pressings. Usually, the sound on such thick vinyl pressings is full-bodied, vivid, and even dramatic. Do not expect to obtain such a majestic analog sound from a digital recording! (e) Mono pressing of this title is much rarer, and by far more preferable to its stereo counterpart. We think that the mix is more natural, humane, "organic" and that the mixes are somewhat different than on the stereo version. We estimate that stereo copies of this album outnumber mono pressings by a ratio of at least 10:1.